I'd like to say a huge thank you to Stella Martin and everyone I met at Borough Green Primary for the wonderful welcome they gave me when I visited last week! Before the visit, Mrs Martin had sent me some letters a few of the children had written about my books. They were incredibly thoughtful and articulate, so I was looking forward to meeting them very much. They were just as thoughtful and articulate in real life, and I'm sure some of these young readers will be writing books of their own very soon! It was a pleasure to talk to Years 6, 5, 4 and 3 about my own journey from being a reader to a writer, and about following your dreams. They had some fantastic questions for me, and I was hugely inspired to see all the enthusiasm for reading and books out there. 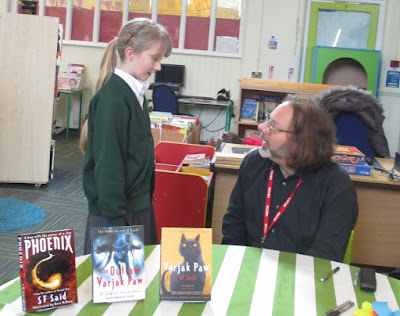 We didn't quite have enough time to answer all the questions everyone had, so if anyone from Borough Green Primary has another question they'd like to ask, or would like to say anything about my books or the visit, just leave me a comment below! And if you'd like to know more about the visit and see some more pictures, here's a link to a fantastic blog Mrs Martin made about it. Hello Mr. SF Said. I'm from Turkey. I read your Varjak Paw book,it was great! Then I thought I should definitely read the rest. But "The Outlaw Varjak Paw" is still not in my country. PLEASE HELP. I'm doing research for 3 days. Thank you for your messages! It's great to hear that you enjoyed Varjak Paw so much. Unfortunately, authors don't get to choose which of their books are translated in which countries - it's totally up to the publishers each country. So if you would like The Outlaw Varjak Paw to be translated into Turkish, I think the best thing you could do would be to make the Turkish publishers of Varjak Paw aware that there are people who would like to read the second book too. Do you know any other Varjak Paw fans in Turkey? Perhaps you could organise a campaign on social media! I'm sure that if enough readers wrote to the publishers asking for The Outlaw Varjak Paw to be translated into Turkish, they would change their mind and publish it too.